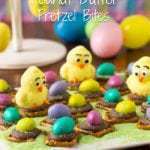 Cute and easy Easter treat that will delight kids and adults alike! Distribute the waffle style pretzels over the parchment paper. Top each waffle pretzel with a candy melt. Place in the oven for 2 minutes. Remove the baking sheet from the oven, and, working quickly, press a peanut butter egg into each candy melt. While the chocolate is still soft, sprinkle the green colored sugar over top.